Condition Red Ordnance Manufacturing (CROM) has this “riddle of steel”: how to create a highly portable platform that can fire .50 BMG bullets quietly. The answer is the .500 Blackout chambered Zero Dark Fifty. CROM already manufactures a .338LM chambered AR with their CR-7 platform, and were wanting to expand that platform to other possibilities. After some experimentation, they came up with the .500 Blackout. The 911gr bullet they have as their primary load produces 2385 ft/lbs at roughly 1085 ft/s, roughly 5x the energy of subsonic .300blk. CROM claims a max effective range of 1000m, and a velocity loss of only 9% at 400m. COAL is 3.8″. 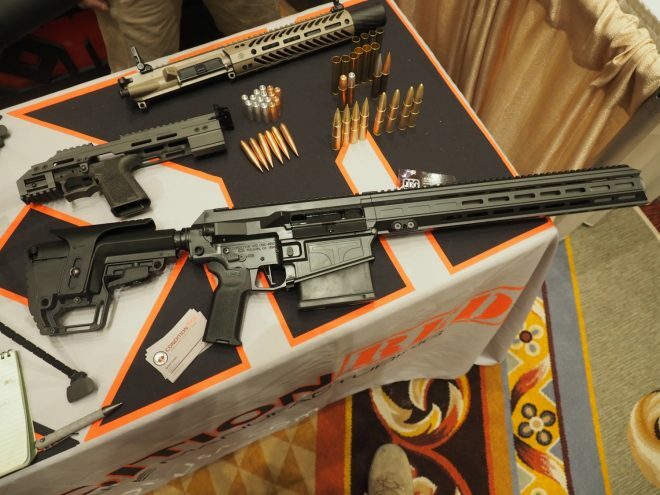 Final barrel selection is still in the works, but they showed off two barrel lengths, and both were very portable even with a suppressor attached. After experimenting with a few different twist rates, they are preferring to use a 1;9 twist for now. CROM has a target weight of 9.5lbs and a target price of roughly $5500.00 when they bring the rifle to market. SAAMI certfication of the .500 Blackout is not complete and still in the works. Besides using existing .50bmg bullets, they’ve also experimented with a 600gr solid copper flat point producing 6000ft/lbs of energy at short range, and a 200gr aluminum HP designed to shatter on impact. I think that flatnose round would make a nice heavy brush gun load. Great for hogs. This has been around for awhile. Take a look at the .510whisper and .510 wsm. $550 to screw together a basic 458 SOCOM versus $5,500 for the 500 BO I will settle for my 550 grain jacketed soft points and 500 grain hollow points for subsonic work. A 500 to 550 grain projectile at 1,050 fps will slay medium size game out to 200 yards. All times are GMT -5. The time now is 19:31.